After 4 days of torture, on this date in 1584, Balthasar Gérard (Geeraerts) finally met his end by beheading on the wheel. 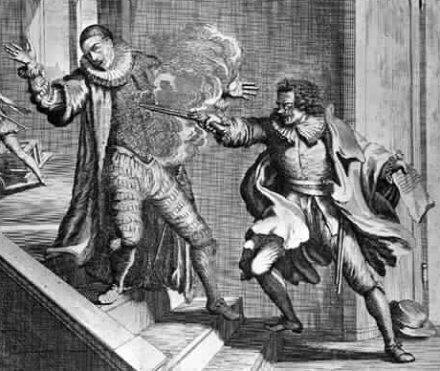 Gérard managed to be both historically important and wholly forgettable: an assassin working for Spain against the Netherlands, his regicide was met with a predictably stiff punishment. Then, no fault of his own, the subsequent course of history** pushed the assassin into obscurity while elevating his prey. 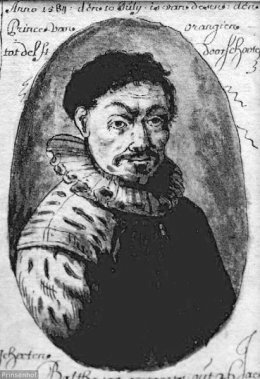 A lawyer by trade, Gérard was a fervent Catholic and supporter of the Spanish crown, which controlled the territory up the coast through the present-day Netherlands. At the peak of its power, Spain’s monarchy — led by King Philip II — had significant cause for concern at the rise in Protestantism. The Spanish were Europe’s paladins of staunch Catholicism, and the sight of her troops did little to endear Spain to her colonized neighbors to the North. For both religious reasons and political ones, the Dutch were looking for a way out from under the Spanish thumb, and a former noble named William, Duke of Orange, was a major instigator in the struggle. In his collected letters and addresses from the period, An apology or defence of William the First of Nassau, William states that, starting in 1559, he became increasingly concerned with plans against Protestants by the Spanish monarchy. That also happens to be the year William was bestowed with stadtholdership of Holland, Zeeland, and Utrecht; in effect, he controlled the Dutch coast. When the head enforcer of that policy, Cardinal Antoine Perrenot de Granvelle, left town, William got even noisier — declaring before the Council of State that Spanish policies were squelching religious freedom. In 1566, the nobleman signed onto the Compromise of Nobles and began funding insurgencies across the northern provinces. As religious unrest grew, Calvinists and Protestants in the French and Germanic portions of Spain’s holdings quickly formed up behind William. An early attempt in 1568 to invade the Netherlands using German mercenaries and French Huguenots failed, but the resultant executions of Egmont and Hoorn put Spain on a long and winding road toward defeat. The Dutch War was afoot, with William leading the way. It would take and dozens of small-scale military victories over the next 15 years (during which William declared himself a Calvinist and fully broke his Spanish ties) for the Dutch to move to independence. The 1580 Union of Utrecht and 1581 Act of Abjuration officially ousted King Phillip II from the Netherlands and installed a new government. Needless to say, Phillip reciprocated William’s love. In 1580, Spain’s top man put a price on William’s head. Juan de Jáuregui tried to collect two years later by shooting the stadtholder, but the man holding the new title of Prince William I of Nassau recovered, while de Jáuregui was killed on the spot. With 25,000 crowns at stake, there were bound to be other takers. Our man Balthasar Gérard started looking for a close encounter with William the Target. At first, he joined the army in Luxembourg, which didn’t get him very far. It was time to gin up a real plot, which Gérard shopped to the Duke of Parma, Alessandro Farnese, in April 1584. Though the Duke offered no funding for the operation — Gérard ponied up the startup money he needed for the trip — and held out little hope that the lawyer would be successful, he gave Gérard assurances that his family would be taken care of in case of disaster. Gérard first presented himself to William in June as the son of a martyred Calvinist from France. On 8 July, he returned and, badly in need of new clothes, managed to beg 50 crowns for a new set. Instead, he bought a pair of pistols and, on 10 July, made history with a point-blank shot to William’s chest. 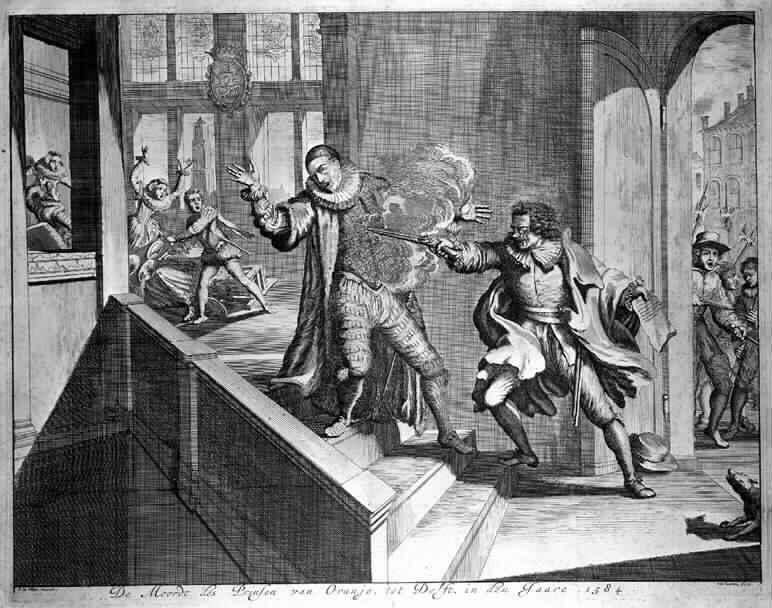 Detail view (click for the full image) of William the Silent’s 1585 assassination at the hands of Balthasar Gerard. This assassination attempt didn’t fail. William became the second head of state to be killed by an assassin’s bullet,† — and his shooter the first such man to be juridically punished for the deed. And, oh, how he was punished. 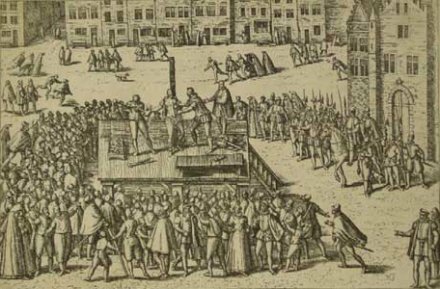 The regicide was beaten immediately after his capture, then subjected to a variety of cruelties, from wet leather boots which, when heated, both crushed and burned the feet, to daily floggings while hanging on a post outside the jail. It was decreed the right hand of Gerard should be burned off with a red-hot iron, that his flesh should be torn from his bones with pincers in six different places, that he should be quartered and disembowelled alive, that his heart should be torn from his bosom and flung in his face, and that, finally, his head should be taken off. For all that he suffered as a regicide, Gérard left his family an impressive inheritance. Making good Parma’s assurances, King Phillip II gave them William’s former lands in three French provinces and took his siblings and their issue into his peerage. Gérard’s cause carried on for another 60 years, until it was finally extinguished by the signing of the Peace of Münster by the Republic of the Seven United Netherlands and Spain. * Foucault mistakenly identifies the torture as lasting 18 days, and the additional details he lays down for Gérard’s time on death row may be less-than-believable. However, all sources indicate that the tortures Gérard endured were quite spectacular, even by the standards of the day. ** See Dissident identities in the early modern Low Countries for a complete treatment of this period in The Netherlands and Belgium. † For example, the city of Antwerp (Belgium), then under possession of the Spanish crown and considered the mercantile center of Europe for its vast sugar trade, featured over 100 executions for heresy from 1557-1562, twice as many as in all of Spain during that time. ‡ The first was James Stewart, 1st Earl of Moray, then Regent of Scotland. Stewart’s shooter, James Hamilton, escaped into exile, though others of the Hamilton clan answered for the murder.